Home » Articles » 138. 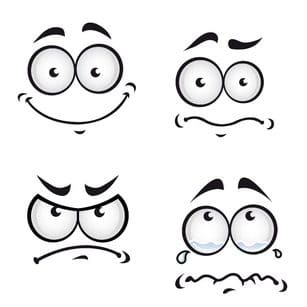 It’s All About These 4 Emotions! Saying what you really feel about what’s going on inside of you. What you are worried about, why you are so happy with someone. It’s something that most people aren’t used to. At school you learn knowledge, facts and skills. In your work, it’s all about facts and numbers. But speaking the language of feelings is another skill. How do you make it clear to someone that you feel angry, that you are concerned, that you are afraid of something? People remain silent and hold it in. And they often do this to spare the other person because we don’t want to get into an argument and don’t really know how we should talk about it. What do you actually feel? And it is so simple. You can always look at your feelings and ask yourself: am I happy, afraid, angry or sad? And once this is clear to you, you can get into a conversation with yourself and ask yourself: what has made me feel happy/afraid/angry/sad? Then you can be quiet and listen to what you hear yourself say. That’s all! Doing this is a mega-step because it will rid your life of a lot of unnecessary fuss! If you want to learn the words to express your feelings, do yourself a favor and watch the videos on You Tube from Marshall Rosenburg. This man explains in a clear and illustrative manner how you can express your feelings in such a way that you won’t hurt the other person or force them into a defensive mode. Because that, of course, also plays an important role: the feelings of the other person! The book he wrote about this, ”Non-violent Communication”, is even easier to read and reads as easily as a magazine. Plain language that everyone understands. 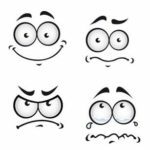 In the MIR-Method, steps 3 and 8 will especially help you with expressing your feelings. It begins with step 3: ‘Detach father. Detach mother’. The exemplary behavior of “feelings are not important” becomes detached from you. In step 8: ‘Optimize chakras and aura’; the main role is for chakra 5, your throat chakra. The more this chakra can freely flow, the easier it will become for you to express your feelings. And how about you? Have you found that it is becoming ever easier to express your feelings since doing the MIR-Method? I’d love to hear about it from you! Please write about it below. Thank you! My wish for you is that it becomes clearer to you what you really feel! i have learned so much of these articles. I notice when I communicate with my children nowadays, I will start by saying how I feel and it opens them up more too. I will surely research Marshall Rosenburg too. Thank you for opening up to your children! And yes, Marshall Rosenberg’s book about non-violent communication is a great book! It is really easy to read and soooo practical! Wishing you great times with your children! 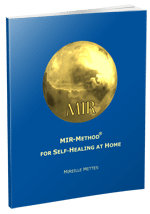 The MIR method has become so much a part of our lives, we hold on to it at any time of distress. Now that I know that we could also use it to understand our emotions I shall help even others with it. So wonderful to hear how the MIR-Method is helping you and your loved ones! I am very happy for you and grateful that you have embraced the MIR-Method. Thank you! Thank you so very much for sharing the MIR-Method with our planet. I discovered it on Oct. 1, and I’ve been doing it twice a day all month. For me it truly helps me to make better & wiser decisions for my health & overall well being. Thank you for embracing the MIR-Method and how wonderful that you can make better decisions regarding your health! I think that could be the subject of another article, because it is indeed one of the things that the MIR-Method sparks. Thank you for sharing it with your family & friends! I am very glad that you can feel it supports you. Hope together we can reach many more people in the world! Thank you Mireille for this very simple and powerful way to get in touch with our emotions, and stop holding them in all the time !! Yes, thank you! Isn’t it wonderful to share this kind of information with each other? I was so happy when I learnt this in the communication skills of Marshall Rosenberg! It simplified so much of my life. I wish anybody would learn about this! Hope your life will brighten up showing your emotions!